The Eagles remain perched atop the Mid-Eastern Athletic Conference after outlasting FAMU for its 17th-consecutive conference win. It wasn’t pretty, but North Carolina Central (3-1) remains atop the Mid-Eastern Athletic Conference after a gut-checking game against Florida A&M (2-3) on national television. NCCU managed to pull itself out of the offensive doldrums of scoreless second and third quarters to come away with a 21-14 win over FAMU. 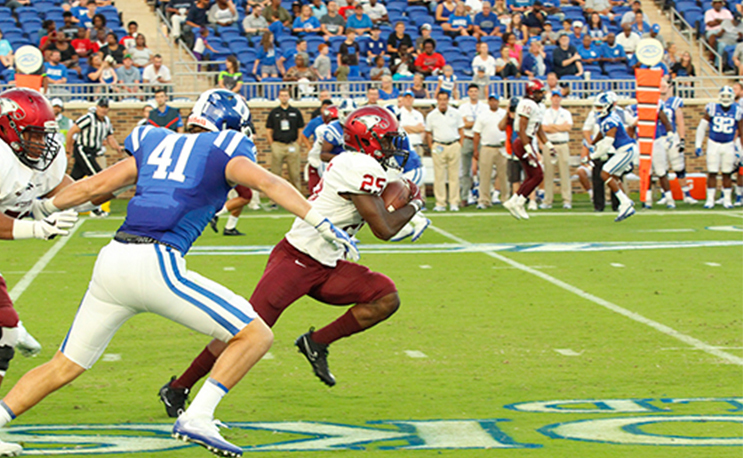 The win was NCCU’s 17th in a row over MEAC competition, a streak that will reach two calendar years thanks to a nine-yard touchdown run by freshman running back Isaiah Totten with just over two minutes to go. NCCU jumped out to a 14-0 lead in the first quarter thanks to an 18 yard run by true freshman quarterback Chauncey Caldwell which was followed 16 seconds later by a 31-yard interception return by Davanta Reynolds and NCCU looked poised to build on that big lead. FAMU would strike back with a pair of touchdowns by running back Ryan Bowers, one on the ground and one in the air to tie the game at 14. That would be all either team would manage for nearly half of the game before Totten’s run gave NCCU the air it needed to rise up for its 17th-consecutive win over a conference opponent. NCCU has not lost in the MEAC since a 28-26 defeat to Bethune-Cookman on Oct. 3, 2015. NCCU will have 10 days to prepare for its next game when it hits the road up to Washington, D.C. to play Howard in an Oct. 7 game that could have MEAC title implications. FAMU travels to Norfolk State that same weekend to face the Spartans.